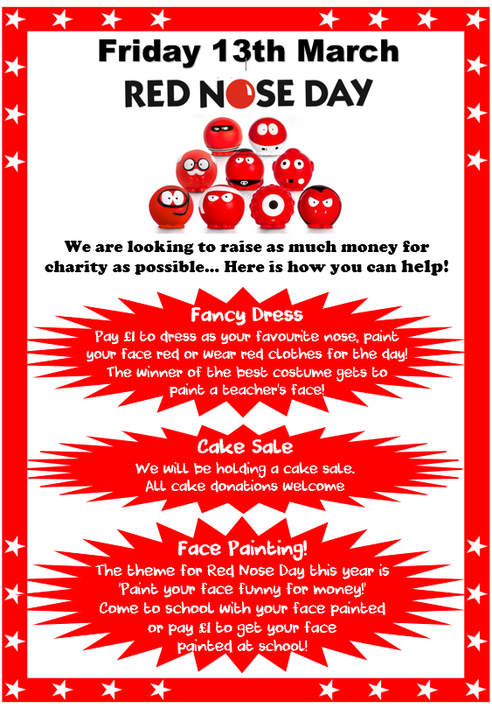 This year we are really excited to be raising money for Red Nose Day on Friday 13th March 2015. To do our bit and raise money, the children and the staff may come to school dressed as one of the nine character noses that are available, paint their faces red or wear red clothes in return for a £1 donation. The winner of the best costume/face will get to paint a teacher’s face! Children can also pay £1 to have their faces painted at school too. On the day we will also be holding a cake sale and all cake donations are welcome. Red Noses will be available to buy from the office from Monday 9th March at a cost of £1.